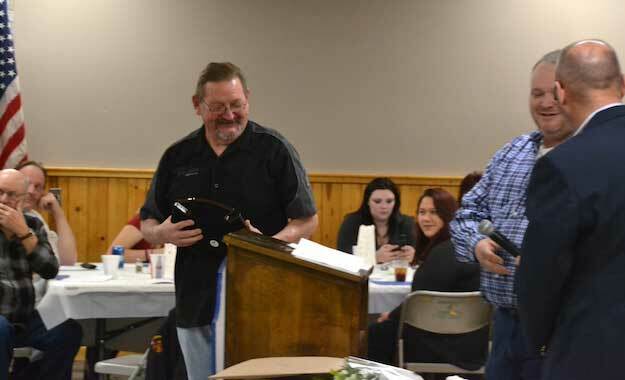 LYNDONVILLE – The Lyndonville Fire Department held its annual awards banquet on Saturday evening at the Carlton Recreation Hall and honored several firefighters, including Wes Bradley, right, who was recognized for 40 years of service to the department. 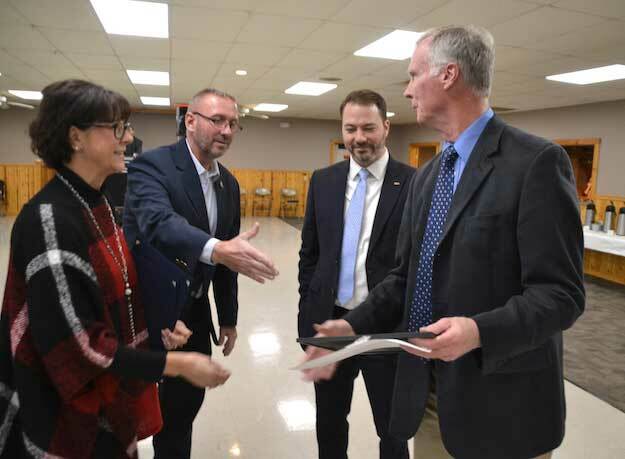 Bradley is congratulated by Eileen Banker, chief of staff for Assemblyman Steve Hawley; Dale Banker, the Orleans County emergency management coordinator, and State Sen. Robert Ortt. Bradley, who also serves as the department’s chaplain, gave the invocation and benediction at the event. Other firefighters were recognized for milestones for years of service, including Emerson “Tinker” Young with 20 years and Jason Gerety for 25 years. 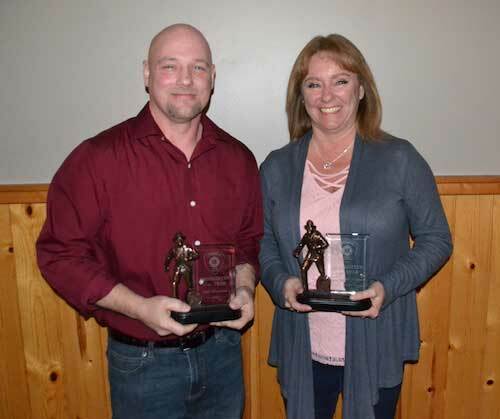 Mike Heideman and Anna Schuner were both named “Firefighter of the Year” for 2018 by Chief Ben Bane. The chief said the two are dedicated behind the scenes in the keeping the fire department running, and also respond to many of the department’s fire calls. “They’re always there willing to help,” Bane said. Heideman, 48, has been active with the fire department for 33 years, since he was 15. His son, T.J., was firefighter of the year in 2016. Heideman said he enjoys helping the community. He works in Lyndonville at Monroe Electronics. Schuner, 49, became an active firefighter seven years ago. She also has been in the Auxiliary for 15 years. Her husband has been a firefighter for about 40 years. Schuner, like Heideman, is trained to be an interior firefighter. When she took the class, she said she was the oldest in the group. “We’re always looking for members,” she said. She urged people, even those without a background in the fire department, to consider joining the fire department. Schuner, who works in research and development at Associated Brands in Medina, also was presented the President’s Award from Gary White, who just finished his first year as the department’s president. Schuner has filled that role before. She was helpful to White with the business side of the department, from paying bills to getting permits for different events. Ken Starr received the Chief’s Award for his service to the fire department. Ben Bane, second from right, is Lyndonville fire chief. 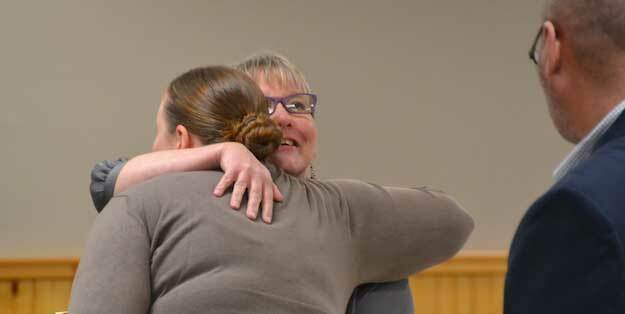 Cindy Grabowski gets a hug from Nicole Kistner, Auxiliary president, after Grabowski received the Auxiliary President’s Award. She stepped up to serve as secretary last year. 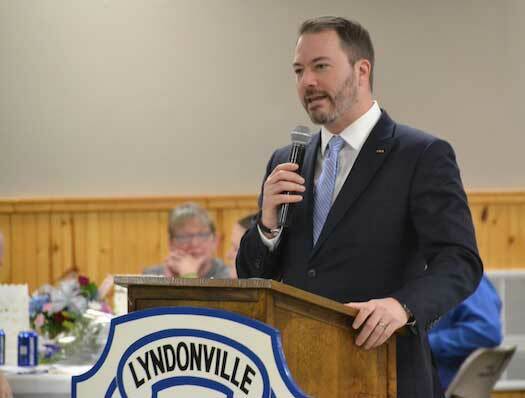 State Sen. Robert Ortt said the community is fortunate to have dedicated volunteers in the fire departments. Not only do they serve their community, but they often assist neighboring departments when he needed. He noted Lyndonville responded after midnight on Jan. 21 in the bitter cold when Barker’s village office and library were consumed by fire. 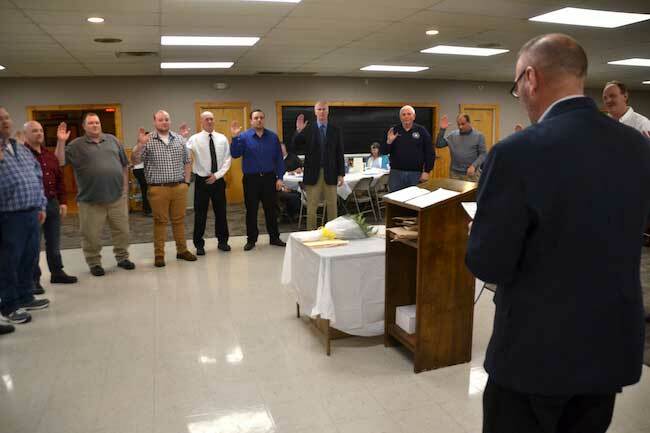 Dale Banker, right, the county’s emergency management coordinator, administers the oath of office to the fire department and auxiliary officers. The fire officers for 2019 include: Ben Bane, chief; Steve Bane Jr., first assistant chief; Mike Heideman, second assistant chief; TJ Heideman, fire captain; DJ Woodward, fire lieutenant; Wally Snyder, EMS captain; Harold Scribner, fire police captain; and Wes Bradley, chaplain. The executive officers include: Gary White, president; Greg Schuner, vice president; Peter Kage, secretary; and Jim Wells, treasurer. The Auxiliary officers include Nicole Kistner, president; Cheryl Mapes, vice president; Cindy Grabowski, secretary; and Anna Schuner, treasurer.